He’s a judge on Britain’s Got Talent, and David Walliams is a man of many talents himself. His comedy partnership Matt Lucas initially made him a star, but it was when he branched out into children’s books that he really hit the big time. Perhaps the biggest compliment Walliams has received over the last few years is being compared to Roald Dahl, who is still in many eyes (including mine) the best ever children’s author. My eldest daughter Isla, 11, is a big fan of Walliams’ work – she has read all his books and looks forward to the TV adaptations during Christmas and Bank Holidays. Awful Auntie, the author’s seventh book which was first published in September 2014, is one of her favourites. The story is set in the 1930s and revolves around Lady Stella Saxby, a 12-year-old girl who wakes up one day, bandaged head to foot, to find out that she has been in a coma for three months and has no recollection of what happened. She discovers, in a rather cold and brutal manner, from her Aunt Alberta that she was involved in a car crash with her parents, Lord and Lady Saxby, who sadly died. Stella soon becomes aware that her Aunt is someone she should fear. She is no normal Auntie. She’s seriously lacking in sympathy and morals and will do whatever it takes to get her hands on the deeds to Saxby Hall and Stella’s inheritance. Assisted by her enormous pet Bavarian owl Wagner, who she has raised since she hatched, and comical elderly butler Gibbon, Aunt Alberta is one scary lady. So can Stella, with the help of the ghost of chimney sweep Soot who she discovers locked in the coal cellar, find out the truth and thwart her Aunt? Following the success of the award-winning Gangsta Granny, Awful Auntie has now been adapted by The Birmingham Stage Company and started touring last March. Isla and I, along with my wife Rachel and our youngest daughter Evelyn, seven, took our seats in the audience for its latest stop-off at Sheffield’s Lyceum Theatre. 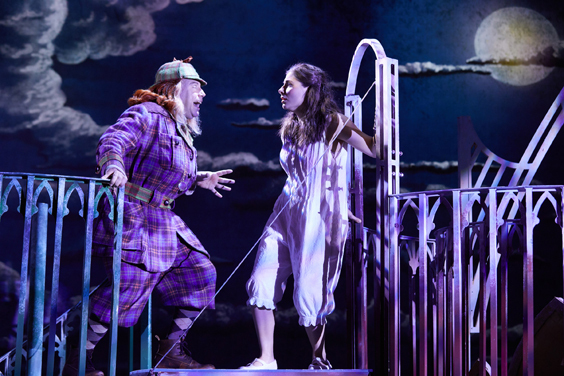 From the outset, it was clear that director Neal Foster has taken inspiration from the likes of Mary Poppins, Sleeping Beauty, and other classic fables to adapt Walliams’s tale. 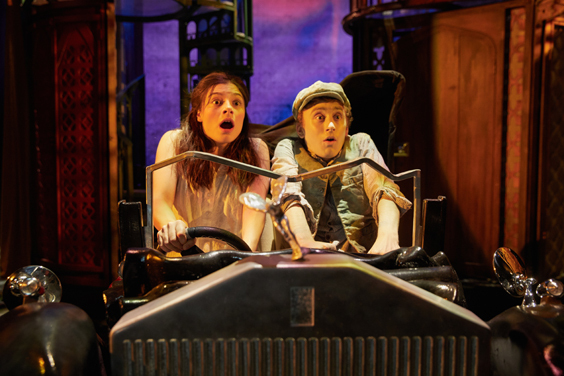 The superb set design by Jacqueline Trousdale conveys the rambling, creepy rooms of Saxby Hall by using just four 360-degree stairwells that house an array of props, hiding places and chimneys. This simple but perfect set-up can also be moved with ease, meaning there were no big, time-consuming set changes that can distract the kids in the audience. Playing Stella was the wonderful and endearing Georgina Leonidas (Harry Potter and the Half-Blood Prince). Ashley Cousins was also great as the Frank Spencer-like Soot, delivering some entertaining Cockney one-liners. As with Miss Trunchbull in the stage version of Matilda, Aunt Alberta is played a man – in this case Timothy Speyer. Dressed in a ginger wig and red tartan breeches, his facial expressions reminded me of some of Terry Jones’s comedy creations. But our favourite character was Alberta’s bumbling butler Gibbon (Richard James) – whose tendency to walk on stage, say something ludicrous, and walk back off, was unexpectedly hilarious. And finally, you may wonder how they managed to have an owl on stage. The answer is with the imaginative puppetry of Roberta Bellekom. Walliams’s story of frights, fights, flights and friendship brilliantly conveys the energy and innocence of the orphaned Stella, while depicting the grotesque horrors that she faces at the hands of her wicked aunt.And as with many of the authors’ children’s tales, there is a surprising but deeply heartwarming twist at the end. In short: it’s Awfully good.